conviction that they are really in the picture, and not from a jaundiced eye or an inherent spleen of disposition." 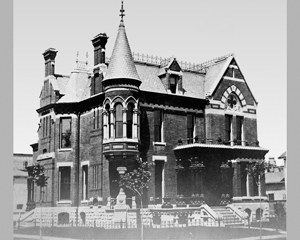 In downtown Detroit there exists a grand residence built in the Venetian Gothic style some 130 years ago. It stands now in ruins seemingly more comfortable in the company of a lonely castle in the Scottish Highlands than in the shadow of Ford Field (Detroit Lions), Comerica Park (Detroit Tigers), and Joe Louis Arena (Detroit Red Wings). Though its only occupants for the last 40 years have been crack dealers and the local homeless population, its history reflects the length and breadth of the American Experience.